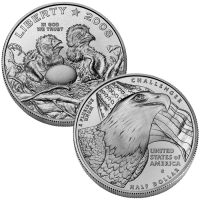 The 2008-S Bald Eagle Commemorative Uncirculated Half Dollar Coin was struck by the US Mint to recognize the recovering numbers of the bird chosen over two centuries ago to become the national emblem of the United States. When first chosen as the emblem of the country, there were hundreds of thousands of the birds flying in the sky. By the mid-1900′s, their numbers had dwindled to under a thousand. Steps were then taken (including the introduction of the Endangered Species Act) to reverse that trend. The conservation efforts have proved quite successful and the bald eagle numbers are on a rise. The US Mint added surcharges of $3 for each clad coin, $10 for each silver dollar and $35 for each gold coin. Those surcharges were then forwarded to the American Eagle Foundation to continue its work with the birds. Each Bald Eagle Uncirculated Clad Half Dollar was struck to a diameter of 1.205 inches with a weight of 11.34 grams. The US Mint released the Bald Eagle Clad Coin on January 15, 2008. 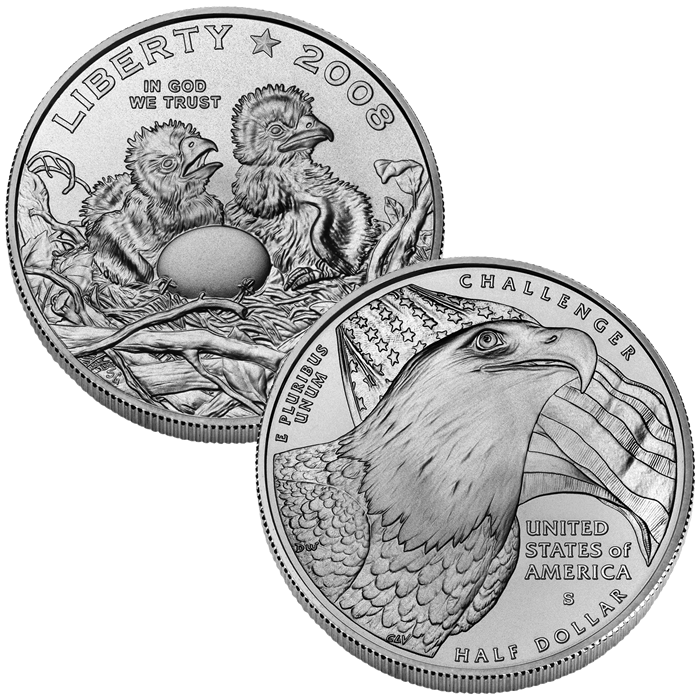 The Mint released the Clad Eagle Uncirculated Coins for $7.95. The US Mint facility in San Francisco struck the Clad Eagle Coins an bear the ‘S’ mintmark. The obverse (heads side) of the Eagle Clad Coin shows two baby eaglets in a nest with an unhatched egg and was designed by Susan Gamble and sculpted by Joseph Menna. The reverse (tails side) features an image of a non-releasable Bald Eagle named Challenger who has been trained to fly free during the playing of the national anthem at select events. It was was designed by Donna Weaver and sculpted by Charles Vickers.